Chocolate Brownie Cookies for Chocolate Monday! Brownies are wonderful but rather messy to eat. Cookies travel well but can be dry and crumbly. A combination of the two would be perfect wouldn’t it? Well, you’re in luck today because we have that winning combination. The dense chewiness of brownies wrapped in a crispy cookie exterior. Heaven by the bite! Is this what you thought today’s recipe would be? That’s the fun of Chocolate Mondays!! Today’s recipe is from Claudia Fleming, Pastry Chef of Gramercy Tavern in New York City. Claudia is one of America’s finest Pastry Chefs and a celebrity in her own right. From her bio on StarChefs.com: In 1991, Claudia was determined to hone her skills and she decided to go directly to the source and study pastry in Paris. After a stint at the prestigious Fauchon, Claudia returned to New York and a new career. Back in New York City, Claudia delved into pastry making at Montrachet, TriBeCa Grill and Luxe. In 1994 Danny Meyer and Tom Colicchio hired Claudia as pastry chef of their new restaurant, Gramercy Tavern – the perfect complement to their new team. Like the rest of Gramercy Tavern’s food, Claudia’s baking style relies on the use of seasonal ingredients. She favors creations that maintain the integrity of each ingredient, and is committed to intense flavor over architectural flights of fancy. Her minimalist sensibility, ironically, allows for maximum flavor. Adding coffee to chocolate desserts makes them taste more chocolatey! Claudia’s work has already been celebrated in publications such as Art Culinaire, Bon Appetit, Chocolatier, New York Magazine, The New York Times, and Time Out New York. She has been named one of Saveur Magazine’s “Saveur 100” and “Best Pastry Chef in New York” by Manhattan File. She has also appeared on the “Martha Stewart Living” show. These cookies are fairly delicate. When you look at the recipe you may be surprised that there is only 1/4 cup of flour and 1/4 tsp of baking powder in the mix. In this case, beating the eggs until thick provides the majority of leavening for the dough. When making this dough, don’t take any shortcuts when beating the eggs. You’ll thank me later! The Artist is addicted to cookies – especially chocolate cookies! When we go out to dinner, if there are cookies on the dessert menu, I can guarantee that is what he’ll order, no matter how many other tempting items are listed. These cookies make him smile, and I’m sure they’ll do the same for you too! A little baking chemistry for you … most baking powder sold today is called Double-Acting. This means that part of the chemical reaction happens when you mix it with liquids, and then it activates again when you heat it. In the old days you had to mix everything together quickly and pop it in the oven before the baking powder stopped working. Isn’t technology great! The rule for how much baking powder you use is 1 to 1-1/4 tsp per cup flour. Use too much and it will produce bubbles that are too big, and instead of holding up the structure of the cake, they push their way to the top. With no bubbles left in the batter, your cake will be sunken, heavy, and leaden. Folding gently integrates ingredients without deflating air that has been beaten into one of the ingredients, often egg whites. If you are mixing beaten egg whites into a heavy batter, mix about 1/3 of egg whites in first, stirring to lighten the mixture. This allows the remaining 2/3 of egg whites to retain most of the air you so painstakingly beat into them. Place remaining egg whites on top of dough. Using a large rubber spatula, starting at the top center of the bowl, pull the spatula to the bottom toward you. Roll your wrist, pulling dough from the bottom of the bowl and moving it to the top. Spin the bowl 1/4 turn and repeat. Keep going until all egg whites have been incorporated. Your goal is to get everything evenly combined with no streaks without stirring or beating the mixture. In the bowl of an electric mixer with the whisk attachment, briefly whip the whole eggs to break them up. Add the sugar, espresso, and vanilla and whip on high speed for 15 minutes, until thick. (This will help add body to the batter because there is so little flour in the recipe.) If you are using a hand mixer, this could take as long as 30 minutes. Be prepared! While the whole eggs are whipping, place the butter in the top of a double boiler, or in a small metal bowl suspended over a pot of simmering (not boiling) water, and scatter the extra-bittersweet and unsweetened chocolate on top. Heat until the butter and chocolate melt. Remove the boiler top from over the water and stir the chocolate and butter until smooth. When the egg are done whipping, remove the bowl from the mixer. Gently fold the chocolate mixture into the egg mixture until partially combined (there should still be some streaks). Add the flour mixture to the batter and carefully fold it in. Try not to deflate all the air bubbles you worked so hard to build! Fold in the chocolate chips. If the batter is very runny, let it rest until it thickens slightly, about 5 minutes. Drop the batter by heaping teaspoonfuls (not tablespoons) onto the prepared baking sheets and bake until puffed and cracked, 8 to 9 minutes. Cool on a wire rack before removing from the baking sheets. Claudia Flemming writes: These are one of my signature cookies. They taste like miniature brownies — but oh, the texture! They're reminiscent of a meringue, with a soft, chewy, fudgy center and a crisp exterior that crackles appealingly. 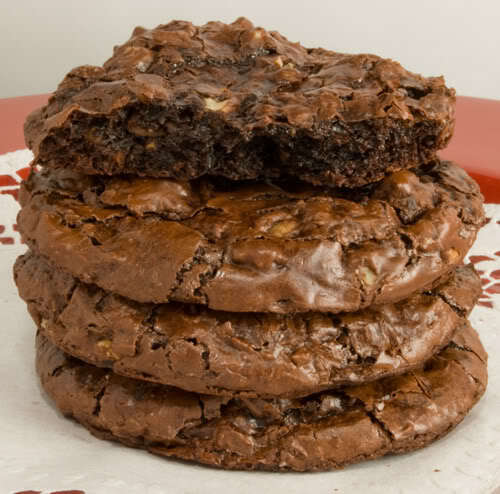 Since these cookies are smaller and less dense, they have an elegance that brownies lack. And they don't require the same commitment as a big, gooey bar. I can never eat just one of these. They are also a particular favorite of Gramercy Tavern owner Danny Meyer, who can't eat just one, either! NOTE: Most of us use tablespoons to measure out cookie dough. Claudia calls for teaspoons, 1/3 the size of normal! If you want larger cookies you can use a tablespoon instead, but your yield will be far lower. If you want more larger sized cookies, double the recipe. Unauthorized use, distribution, and/or duplication of proprietary material on The Heritage Cook without prior approval is prohibited. If you have any questions or would like permission, I can be contacted via email: theheritagecook (at) comcast (dot) net. Feel free to quote me, just give credit where credit is due, link to the recipe, and please send people to my website,www.theheritagecook.com. As an affiliate member, if you click on links in my posts and purchase a product, I may receive a small percentage of the sale. Any commissions received will be used to offset a portion of the costs to run The Heritage Cook. If I have received products for review or had travel expenses covered, I will disclose that in the content of each article where applicable. Reconstitute the instant espresso coffee with hot water. Once it is dissolved, add it the same as you would the espresso, in the same amount, 1/2 tbsp. You can also just use water if you prefer. Can i replace the unsweetened choco with cocoa powder? Where i live is very very difficult to find unsweetened choco, but we have van houten cocoa powder. If it is possible then how many tbsp or cups of cocoa powder should i use? Hi Sophie – Yes you can! The ratio is 3 level tbsp unsweetened cocoa powder PLUS 1 tbsp butter or oil for every 1 oz unsweetened chocolate. So for this recipe you would use 6 tbsp unsweetened cocoa powder and 2 tbsp butter in place of the unsweetened chocolate. I hope the cookies turn out well for you. Enjoy!! I am enjoying my Brownie Cookies with my coffee as breakfast. will laugh. I was standing, beating, complimenting myself on how much technique I had learned from you when I realised that I had, once again, forgotten the sugar! Thank goodness for the lengthy time with the mixer! I was able to save that situation. However, I also added the flour too soon so I did not get the loft but the flavour is exquisite! I guess that addition to your guidance and that of your amazing guests, I somehow still learn best from my copious mistakes. Your gentle teaching style makes me still feel good about myself while I do! You are right Karen, I am laughing! I have a tip for you – I’ve been thinking about this since we baked together. Set all your ingredients on the counter next to your mixer, then as you add them, set the ingredient containers behind you (or to the side). This lets you know immediately when you have added an ingredient and helps keep you on target! Hi Donna – you whip the whole eggs without separating them first. I’m getting ready to make these cookies for a friend that just had surgery (really for her four kids) and was wondering whether I could make the batter a day ahead and keep in the refrigerator. Thanks! Hi Gina – Because there is so little flour in this recipe, it depends on the beaten eggs for leavening. Leaving the batter in the refrigerator will probably result in denser cookies, but I’m sure your friend and her family will love the deep chocolate flavor. It will be a treat to have something homemade while she is recuperating. You are a good friend! Can’t wait to make this recipe but I have one question. . . whole eggs or just the whites? I’ve read the recipe and comments several times but am still unsure. It is whole eggs Melinda – sorry for the confusion. Good luck and I hope you enjoy these wonderful chocolate goodies! Am I to use a balloon whisk to whip up the eggs separately before I use a paddle attachment to beat the sugar, espresso, and vanilla? Use the whisk attachment to break up the eggs and then keep it on while you whip in the sugar, espresso, and vanilla. Take the bowl off the mixer and fold the rest of the ingredients in as directed above. Let me know if you need any more help!! Hi, my new thing is to make cookies and freeze before baking, since it is just my husband and I, we can have a freshly baked cookie anytime, just wondering how you think these would do? I’m with you – I love to freeze cookie dough and have freshly baked goodies any time I want. I think this batter is probably too delicate to be really successful after freezing. The cookies will still be delicious but probably flat and crispy. Give it a try and let us know how they turn out! I tried baking these lovelies earlier today but the batter turned out rather runny even though I left it in the fridge for a few hours for it to thicken. The cookies turned out too flat yet delicious. Are there any ways to solve this problem? Thanks! I’m sorry you had some trouble with these cookies. The trick is to beat the heck out of the egg whites until they are really thick and stiff. You are in essence creating a meringue. When you fold in the chocolate, don’t over mix the batter or you will break down the air bubbles you created and the cookies will collapse. Try them again, beating for the full 15 minutes or longer if needed. Hopefully they will wind up thicker this time!! Good Luck! I just found your website through pinterest. I must make these cookies soon! Thanks for the recipe! Hi Sarah and Welcome! These cookies are a true Grand Slam and I know you will love them!! These are the best cookies!!!!! I love their shiny, crackle top. And they are delicious!!!! (And addictive!!!!) Is there any way to turn these cookies into brownies? Like an 8×8 pan of super delicious brownies? Absolutely gorgeous. Easy to make. SOOOO yummy. i did everything right including beating the eggs until very soft and fluffy (a full 15 mins in the kitchenaid). the batter was way too runny and i refrigerated overnight. even then, my cookies are too flat and they run into each other while baking – the batter is that loose. should i try adding more flour? I know it’s tough to troubleshoot but these look awesome and so many people seem to have had successful attempts. Hi Nags, I am wondering if you possibly over-beat the eggs? A KitchenAid is so powerful it usually doesn’t take as long as other stand mixers. Try again, this time with a little less time beating. The other issue can be moisture in the air. You are right, it is hard to troubleshoot when I am not in the kitchen with you, but hopefully this will help! Every time I try to make brownies (not brownie cookies) I can’t get the crackly top. But when I made these cookies, I got the cracked top!!!! And they’re DELICIOUS!!!!! Is there any way to turn this cookie recipe into a brownie recipe? I was so excited with the shiny, crackly top!!! And did I mention that they taste fantastic?!?!? Can I put this batter in an 8×8 pan? Or do you have a brownie recipe that gets the shiny, crackly top?? Thanks! Hi Christina – I say give it a go and see what happens! I can imagine this would make a beautiful pan cookie/brownie. Give it a try and let us know how it turned out! As both an avid coffee and chocolate lover, I never attempt any chocolate recipe anymore that doesn’t involve coffee in some way. I loved making these cookies, beating the eggs to replace the flour’s job was really cool. I’m also a firm believer in giant cookies, so I doubled the recipe and yielded about 26 cookies. The only slight problem I had was over the course of actually baking the cookies, my dough “dried out” a ton. I’m not sure if it’s because I let the batter sit too long (though I can’t see myself being able to make them any faster than I did), or perhaps beat the eggs too much initially, but by the time the last pan of cookies went into the oven, the texture of my batter was very airy and dry. It didn’t affect the taste from what I can tell, but the last cookies definitely weren’t as easy to drop onto the baking sheet as the first batch. Nevertheless, these are so insanely chocolatey and the perfect marriage between cookie and brownie. I’ll definitely be making these again, with a large glass of milk on standby! I suggest that if you double the recipe again, make sure you stir up the batter a few times while you are panning the cookies. You may have had more liquid in the top half of the dough than at the bottom. It always helps to scrape down the sides and bottom of the bowl whenever you are baking. Let us know how they turn out! Does it matter if i use a whisk attachment instead of the paddle attachment? The whisk attachment beats more air into the batter than the paddle does. Your cookies may rise a bit more and then fall as they cool. It won’t change the fantastic flavor, but the look and texture may be altered. I am so happy to hear that Mel. Great work and thank you for letting us all know!! Hi Jane: This sounds like a fantastic recipe!! I am about to make it, but I am worried about the espresso. I do not drink coffee or espresso, so what could I substitute? I have bought some premium ground coffee to use called LavAzzaCaffe Espresso. Can I just spoon in some of this???? Thanks for your answer, as I love to make good cookies. Hi Elle – you can certainly use the coffee that you have on hand, just make sure you dissolve it in water first so it is in liquid form. Otherwise you can use plain water instead of the espresso. The purpose of including espresso/coffee in a recipe is that it enhances the flavor of chocolate. I hope you enjoy these cookies – they are some of my favorites!! These cookies are amazing! I just made these for the second time. They remind me of the Chewy Chocolate Supreme cookie at Great American Cookie. That’s my usual there; they don’t have a location in Hawaii though 🙁 So when I found this, I was beyond ecstatic. I’m going to try them with macadamia nuts next time (: Thanks! Happy New Year Sasha! What a wonderful message to get to start the year! I am thrilled that these cookies make you happy!! Do you have any high altitude recommendations? I’m at about 6000 ft. I made these today and they just did not have the chewy inside I was expecting. They tasted ok but like I said, not as expected. Hi Cheryl, I am not an expert at high-altitude baking but I did find two resources that may help you. I love these cookies. However I wondering if you have to use a mixer. My first attempt the dough was runny and the cookies came out flat:(. Any idea why? I used the right amount of everything on the receipt… What to get it right for Christmas cookies. I’m sorry your first attempt literally fell flat. Because there is so little flour in the recipe to provide stability and gluten, getting the eggs beaten fully is key to success. The beaten eggs will give your batter the lift/air it needs. It would take a huge amount of elbow grease to whip these by hand to the level needed. The best equipment is a heavy-duty stand mixer (I use a KitchenAid) with tremendous power. The second option is a strong hand-held mixer. The third choice is a balloon whisk and a really strong arm! I hope this helps Allena. Feel free to contact me via email if you want more detailed assistance. I am here to help! Hi Diane – you absolutely can use pecans in place of the chocolate chips, or in addition to them. Whatever makes you happy!! Thanks for commenting – I love to hear from you! Only 1/4 c flour? Really? Yes Becki, as hard as it is to believe, the 1/4 cup is correct! Enjoy the chocolatey goodness of these amazing cookies!! I came across these on Pinterest and thought I’d try them out. They turned out really well! I live in the UK so I substituted 90% dark chocolate for the unsweetened as it’s not sold here. Thanks for such a great recipe, I will definitely make these again! Hi Louise, how wonderful to hear of your baking successes in the UK. I am thrilled that the recipe worked for you and hope you and your family enjoy these cookies for years to come!! A good, rich chocolate cookie, but I got nowhere near 5 dozen. 2.5 Oreo sizes cookies, maybe. Next time I’ll double the recipe. Thanks! Thanks for letting me know Maggie. I modified the yield. The recipe calls for heaping teaspoons of dough which is much smaller than most of us are used to making. That probably explains the disparity, but it is always better to be clear! Hi! Love the recipe. I wanted to make these cookies for my boyfriend but they will have to travel either by mail or on an airplane with me. What is the best way to store them and how long do they keep their fudgy chewy texture for? Hi Kara, Obviously you want to bake them as close to shipping/taking as you can. Soft, moist cookies maintain their texture longer than crispy ones do. When they are completely cool, layer them in an airtight container (like a cookie tin), each layer separated by sheets of waxed paper. They may not be quite as pretty, but should still taste delightful and I know your boyfriend will love them!! I like to use food saver bags to ship my baked items. (or a vacum sealed food storage container.) They are a bit pricier, but when I send things to my friends or family in the military or overseas, I never know how long it will take to actually reach them. I found that vacum sealing the food works the best to keep things fresher. You can leave out the espresso entirely. It just enhances the chocolate flavor. I would add 1-1/2 tsp of water to compensate. Hope you enjoy these!!! These were delicious. Mine turned out more “cake like” not flaky. Any suggestions? Hi Sarah, There are so many variables in baking that it is hard to tell. It could be the percentage of protein in the flour you are using. Lower protein creates a more tender crumb in cakes. These cookies shouldn’t be flaky, more fudgy in the center with a crispy exterior. Hope this helps! For the egg mixture, should I be using my paddle or whisk attachment? I noticed the words beating and whisking in the directions, so I wasn’t sure. Thank you in advance, as these cookies sound delicious and I can’t wait to try them! Hi Heather – Use your paddle attachment to beat the batter. The whisking is done to blend the flour mixture before adding to the eggs. I know you will love these cookies!! Hi Jane, I tried this yesterday with my 9 year old daughter helping me. Your instructions were very detailed and well written. Really appreciate that too. Mine did deflate towards the end of baking time, but it was totally delicious. Will definitely be trying this again! Thank you very much for this keeper of a recipe. Yea Asha! I am thrilled to hear that you are sharing this experience with your daughter and had fun baking together!! I love hearing about families sharing baking and cooking experiences. Thank you so much for letting me know and keep up the great work!! These look scrumptious! I have one question about the mini chocolate chips. Do they need to be semisweet or milk chocolate chips? Thanks! I’m looking forward to making these VERY soon! Hi Katrina, you can use whichever you prefer, or get wild and try something else – maybe mint chips or butterscotch? Have fun! the one fourth cup of flour for the chocolate brownie recipe doesn’t sound like enough – should it be one and one fourth cup? Hi Margo, Believe it or not, the 1/4 cup flour is the perfect amount in this recipe. One of the tricks to this recipe is to beat the eggs as long as the recipe states to get the maximum “lift.” I hope you love them as much as I do! Oh, Jane, these brownie-cookies truly do look sensational. Three types of chocolate, espresso, and the likelihood of fewer telltale chocolate smears to reveal that I’ve been raiding the cookie jar! Many thanks for sharing this must-make recipe. It is my pleasure Barbara! I hope you enjoy them as much as I do! HI Jane… Great recipe…..Grand son ( 3yrs) and I made these. Used strong coffee and He wanted to put in smarties. (He puts them in everything…..even the roast beef gravy last week…:( ) They turned out delicious but how can you go wrong with that much chocolate.. Thanks for a real change up from the original recipes out there. How wonderful Bonnie! It makes my heart sing to hear when people are bringing young ones into the kitchen, baking and cooking together. I am so pleased that you enjoyed the cookies. If you like chocolate, I feature it every week on our Chocolate Mondays. Swing by and join in the fun! !